Spring is just around the corner, now if we could just get the weather to cooperate. In anticipation of warm days and sunny skies, The Modern Pantry in Clerkenwell is featuring a riesling paired Spring Tasting menu for the month of March.This is first of what they promise to be a series of wine themed dinners. I think it’s apt to have riesling for Spring as it’s such a refreshing wine with it’s racy body and zippy, zingy acidity, represented by the New World’s offerings to the rich honeyed aromas and ripe stone fruit flavours and minerality of the Old World, riesling rarely let’s me down. It’s also a very versatile food wine and, with recently awarded MBE, Anna Hansen’s cuisine, is the perfect partner to the often spicy, exotic flavours of her food. The wines were chosen by Bill Knott for the restaurant and what was most interesting was that Bill said he chose the wines first and then worked with Anna to find just the right food matches. Usually, it’s the other way around when doing food and wine matching. Bill chose an array of rieslings showcasing it’s versatility from a variety of wine growing regions, from its homeland of Germany to the ends of New Zealand, we were presented with a delightful profile of the grape. An amuse bouche of tempura battered oysters was followed by the first course of Black fried squid paired with a kabinette riesling, the Bernkastler Badstube 2010 from the Mosel was a nice foil to the spicy sweet squid, the wine being slightly spritzy with loads of sweet ripe peach fruit on the palate, salty and sweet…mmmmm. Albert Mann is a great producer from Alsace and biodynamic to boot. His wines are always refined and fresh, the 2009 Albert Mann was pleasingly aromatic, almond blossom notes floating about. A slightly off dry but tasty wine with delicious ripe fruit on the palate. 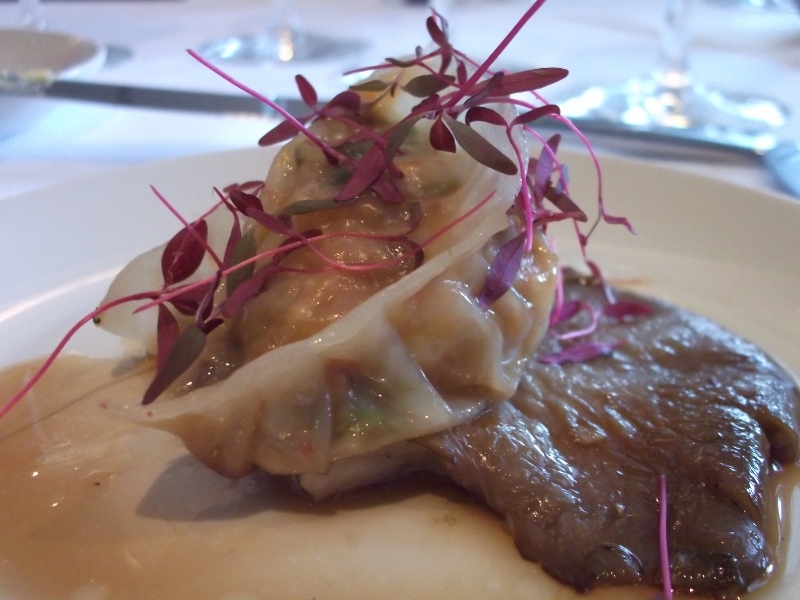 The seared King oyster mushroom, yuzu & tamari and kimchee & manouri pot sticker was excellent, the kimchee having just the right amount of heat but not overpowering the flavours of the wine. Riesling goes so well with kimchee, an unlikely pairing that somehow works. The Pyramid Valley 2008 Riesling from Riverbrook, Marlborough was a much drier creature, coming from New Zealand, with good structure and a pronounced mineral note on the nose.It was rich on the palate and had lemon sherbert, butter pastry flavours with faint herbal notes on the finish. 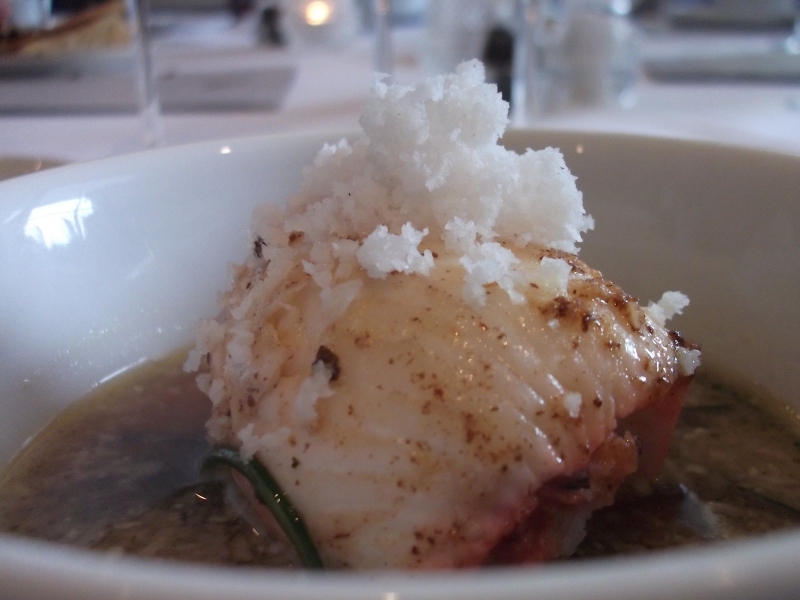 Served with a sole Duglere in a lemongrass broth, a mouthwatering pairing. Australian riesling I’ve always had a bit of an issue getting my palate around that very pronounced lime character along with the extreme leanness of the wines. Someone mentioned lime cordial when referring to this wine and I think that is a very apt description. We were drinking the Cascabel 2010 from the home of Australian riesling, Eden Valley. This was representative of the region but I would have like a fleshier wine. Some of us went back to the Pyramid and preferred it with the Poppy, caraway and balck onion seed dusted guinea fowl breast with Iranian lime & smoked anchovy dressing that the Cascabel was paired with. The Eden Valley wine was just a bit too stark and was all I could taste whereas the Pyramid’s fruit was a more harmonious match, not overpowering the food. We were divided on that pairing but it made for a lively discussion round the lunch table. Noble rot, how I do love it! 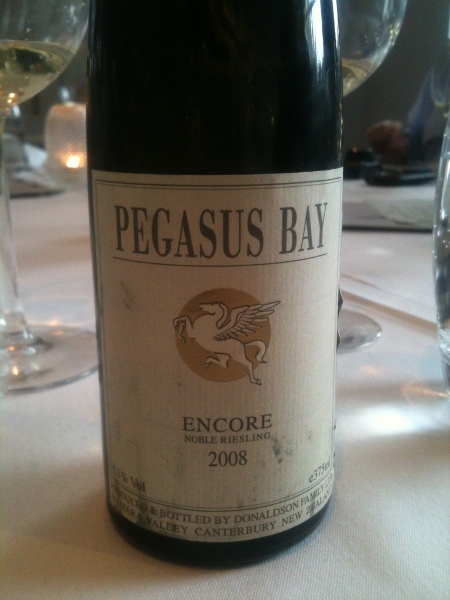 The Pegasus Bay, Encore Noble riesling 2008 finished off the lunch paired with stem ginger ice cream and stewed rhubarb. 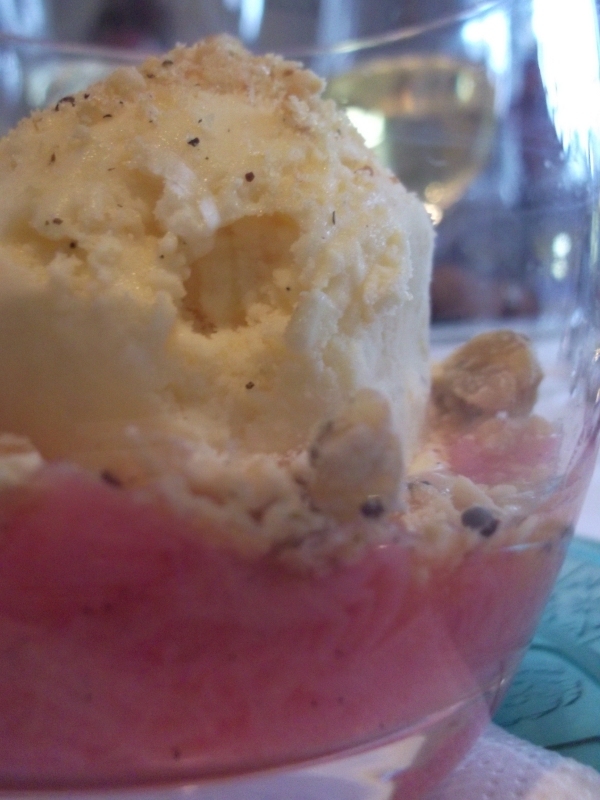 The intense honey and toasty aromas of this wine rushing around my nose, the palate bursting with ripe white peaches, nectarines and tangerine flavours, a luscious wine which complemented the ginger crumble sprinkled atop the ice cream. The riesling tasting menu is on now and is £50 per person without the wines or £80 with the paired wines. An excellent deal. The restaurant will be changing the menu every 6 to 8 weeks so there’s still time to enjoy this meal. It’s only available on the first floor dining room or if you’re feeling like supping with a group of friends, the Foundry Room where we dined, seats 12 and is available for private do’s. 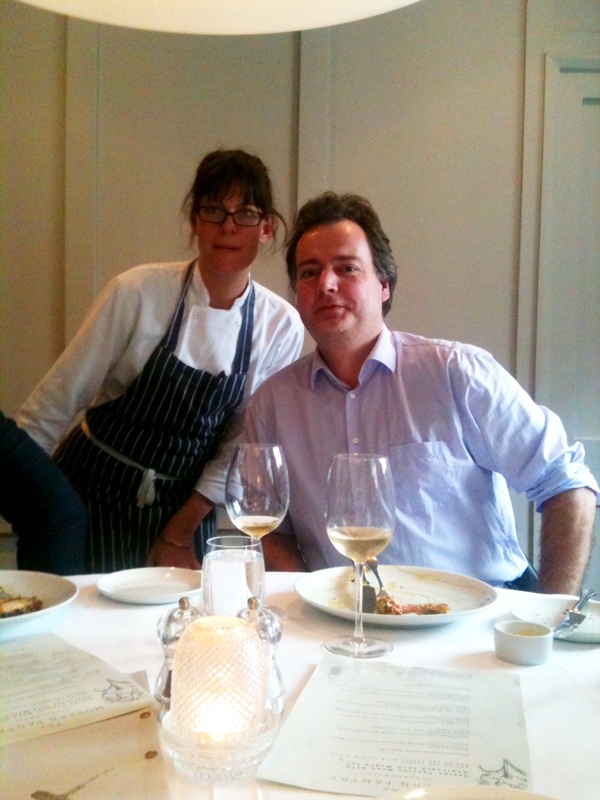 Many thanks to The Modern Pantry for inviting me to a most delicious food and wine matching lunch.